Including breathing exercises, hologram-inspired visualizations, and unity consciousness practices, the Tablets of Light allow you to create tangible results in your daily life as you move higher on the evolutionary scale of divine awakening and develop a divine partnership with Source. 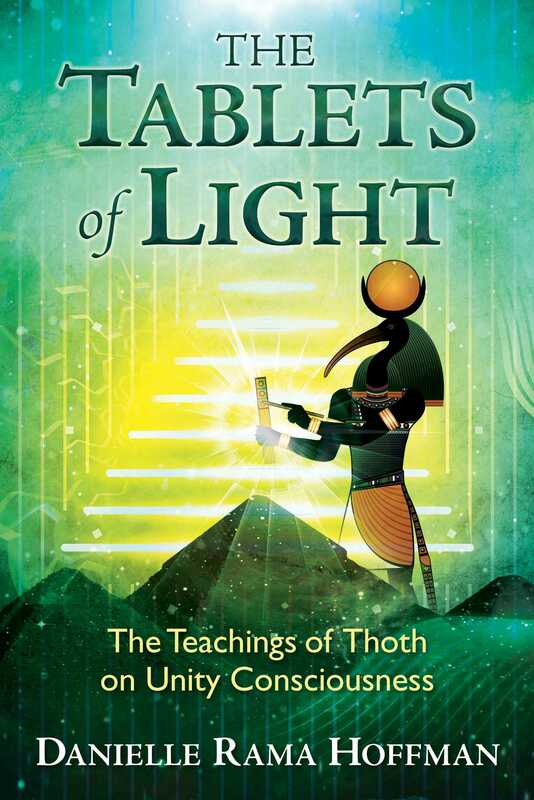 Guided by Thoth and his Tablets of Light, you will rediscover the undiluted version of yourself and your soul’s purpose, accept your Divine Light Mission as a Divine Incarnate, and set the stage to return in the next life as a fully resurrected Being of Light. In the example of glass blowing, you have 2000-degree glass that’s been melted; it’s in a semi-liquid form. As the creator of the glass you can make huge pieces; you could have installations that were larger than trees. Or, as the person that works with glass, you could make a bead for a necklace. You’re working with the medium of this heated glass that allows you to create; it’s malleable. Some of you that have wanted to manifest or actualize things in the past have been frustrated. You haven’t been able to do it, and it just seems like this light, the third dimension, is not listening to you. Or it’s been so much effort, or you’ve tried everything and it hasn’t worked--there will be a sense of Ahhh. It’s because you were trying to do it backward up, or you were trying to do it outside in, or you were trying to do it with a glass that had already been formed rather than its malleable state. Because when you’re an adept with light, frequency, and Divine units of consciousness, and now you’re working with these highly concentrated vibrations and energies, then everything unfolds in a way that feels easier, more natural, more magical. That is also where, at times, you have to stop yourself from trying to do it how somebody else is showing you how to do it. That’s why we don’t provide “eight steps to being the Divine, awakened being.” We provide an environment that, as you’re within it, sparks what you know is true for you. This is where we get into your unique, Divine design. Having access to these high frequencies, and high vibrations, and the highly refined energies, and the concentrated units of consciousness that create all that there is, working with these elements at their most potent state also nourishes, awakens, sparks within you your unique design. It’s an alchemical process; it’s alchemy. Seeing the communion, the correlation of this universal Divine design and this personal Divine design, there is this partnership, this Source Source, this correlation, this origin origin. Staying with the universal Divine design and what it is that you have access to, and these highly refined energies, frequencies, ways of being, Divine qualities, all that there is, hold within yourself an awareness of your universal Divine design as well as your brilliant system as an incarnated Divine being. As you’re focusing on your universal Divine design, have an awareness of DNA unlocking, of divinity codes sparking and awakening, of connection to these vibrational units of divinity, of the emembering, of yourself as Source consciousness. It’s not only happening in your body, in your incarnation - it’s happening on all levels. As you have been spending more and more moments in unity consciousness, inclusion, Source cohesion, Source light, it’s like you’ve been in the liquid glass of divinity. Now, this is having its natural alchemical progression, or evolution, that you are able to sense in your body or in your incarnation. It’s not like you are only sensing it in one place; you’re sensing it on all levels. Just like with the example of glass, you have a period where you put the piece in an environment where it can go through this transition from having been heated to cooling down. The alchemy and the chemistry of the color, for example, become visible during that cooling process. You may have the experience of making a piece and you know what it is, and you have an idea of what colors you put in, and then you put it in the box. A few days later you go to look at it after it’s been taken out of the box, or you go to take it out of the box, and you may be surprised. You’re able to see how the colors and the techniques that you used translated into the glass’s full incarnation when fully cooked. This sensation of it being revealed or unveiled in this stage is also similar to how it is that you may be aware of yourself in this moment. You are able to see this universal Divine design in ways that may even be surprising to you. It’s not that Divine designs are only existing in your body, or in your incarnation, they are also simultaneously connected to the multidimensionality and being informed by these highly refined and potent Divine unity consciousness energies. There are so many examples in your natural world of what you see and what you don’t see. You see a tree, yet most of the time you don’t see the roots of the tree. You see the front of the mountain but you don’t see the back of the mountain. You see the field that’s been planted, yet before it sprouts you don’t see the seed that you planted. When you look at the tree before it blossoms, before it bears fruit, you don’t see the figs, oranges, olives, apricots, or whatever it is. It’s not like they don’t exist; it’s not like they’re inside of the branch. It’s like a 3D printer that can take a picture of something and take it from being two dimensional to three dimensional. That’s what we’re describing in the multidimensionality. All that there is exists in all that there is. As you have this adept connection and awakened consciousness with your multidimensional universal Divine design, then that which is vibrating in your Divine unique expression in relationship to your signature energy and what’s uniquely you and yours as you’re choosing it naturally comes into visibility, into your tangible life.